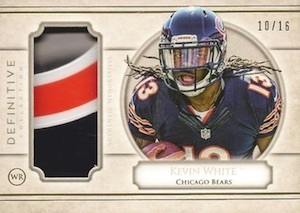 A new high-end entry to the Topps football lineup, 2015 Topps Definitive Collection Football offers a premium option for NFL collectors. Each box promises six autographs and two relic cards. Only featuring autographs, autograph relics and relic cards, the hit-only product focuses on hard-signed cards and quality memorabilia pieces. 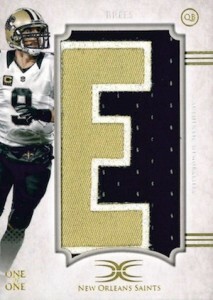 Base Rookie Autograph Patch Collection is billed as "investment quality rookies with the biggest patch seen on an RPA." The numbered cards are also found as Green multi-color patches (#/25), Blue multi-color patches (#/10) and several Red patch options, each numbered one-of-one. 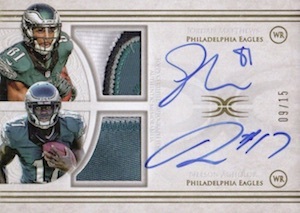 Featuring some of the top names across the NFL, Definitive Autograph Patch Cards (#'d) offer a jumbo patch and on-card signature. 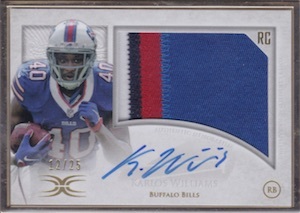 Again, Green multi-color patches (#/25), Blue multi-color patches (#/10) and Red team logo patches (1/1) are an option. Leather Bound Rookie Autograph Patch Book Collection (#'d) takes thing to another level with multi-color patch pieces and a booklet layout. 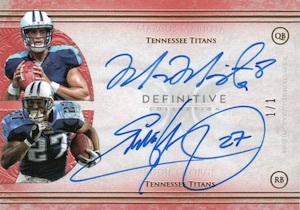 Continuing with the signed cards in 2015 Topps Definitive Collection Football, Autograph Inscriptions Collection (#/d) include up to 40 fan favorites across the past, present and future with a personal inscription. There is also a Red parallel (1/1). 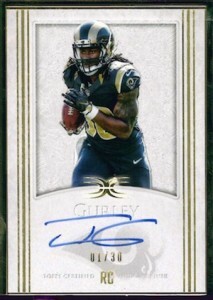 Highlighting the top 35 rookies, Definitive Rookie Autographs are all numbered, with additional choices in the form of Green (#/25), Blue (#/10) and Red (1/1) parallels. Framed Rookie Autograph Collection also covers the first-year class, but only includes the most popular offensive positions. Additionally, the framed autographs come in Blue (#/10) and Red (1/1) parallels. There is also a separate autographed patch version. Not just limited to new players, Legendary Autograph Collection (#'d) includes some of the best all-time players with themes centered around the Pro Bowl, Super Bowl or All-Pro selections. Blue (#/10) and Red (1/1) parallels add to the totals. Pairing two notable players on the same card, Dual Autograph Collection (#'d) offers a multi-player signature set. Green (#/25), Blue (#/10) and Red (1/1) parallels are again available. Collectors can also find an autographed patch version of the insert. 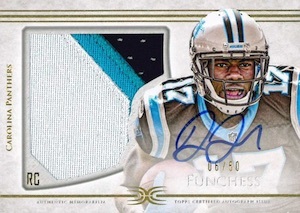 Lastly, a mix of premium relics finish off 2015 Topps Definitive Collection Football. Definitive Helmet Collection (#'d) contain helmet pieces, and parallels offer more options, including Blue chin strap buckles (#/4) and Red NFL shield logo pieces (1/1). Jumbo Patch Collection focuses on larger relic pieces and offers Purple (#/35 or less), Green (#/25 or less), Blue (#/10) and Red (1/1) parallels. Covering up to 60 subjects, Definitive Nameplate Collection (1/1) adds whole letters from jersey nameplates. Definitive Patch Collection opts for unique jumbo patches and is also a one-of-one set. 43 cards. Serial Numbered #/35 or less. 50 cards. Serial Numbered #/99 or less. 10 cards. Serial Numbered #/55 or less. 36 cards. Serial Numbered #/35 or less. 31 cards. Serial Numbered #/25 or less. 50 cards. Serial Numbered #/60 or less. 30 cards. Serial Numbered #/35 or less. $700-$800 for a box of football cards. I don’t care if it’s nothing but autos & patch cards, this is just plain ludicrous. Each year the # of cards decrease in the boxes, but yet the prices continue to got up. If Panini & Topps both continue on the path they are currently traveling, they will ruin this hobby. Just brutal plain design and a lot of rookie bust who wont be in the league in 3 years. The redemptions are too numerous. With Topps history on them also, I am not taking any chances. Product is on point and on card auto’s are blast mode…the haters will continue eating Doritos on the sofa while counting nickels for the next soda….or 89 Fleer commons…. Everyone needs to keep in mind this is geared towards HIGH END COLLECTORS. I’ve seen some real hot boxes and some real duds. There is definitely potential in the product but after seeing the two cases my friend busted contained half of the autos as redemptions I figured it wasn’t worth it even if I had the money for a box. No product at this price should have redemptions especially ones that expire or there is no guarantee that they get fulfilled. This product, provided your redemptions are fulfilled, is worth it but it’s a big if. It’s like any other product. Your going to get your hits and or misses. That’s called collecting. Just don’t spend the money on this product if you don’t want to chance it. Plain and simple. Clearly some people need a lesson in the ole “Supply and Demand” model. Not every set can be chrome and have 8 billion autos of Isaiah Crowell and 7 billion cards in a box at 45 bucks. It’s a different price point for a different customer. If you can’t afford it, just buy what you can afford, but i can’t comprehend why people get so angry at a high end product being issued. It has zero impact to you and your little world. Move along, and stop being so angry in life. the only thing I see wrong with this product so far is the number of redemptions. But with everything being on-card, even dual autos, I guess there’s going to be some of that. You guys stick to your little $50/box sticker auto product, and leave the high end product alone for the big boys, Geno and friends. Looks like National Treasures, but not as nice. National Treasures coming in at $485 a box is a better deal IMO. Topps could have done better for the price, but it is a good try. 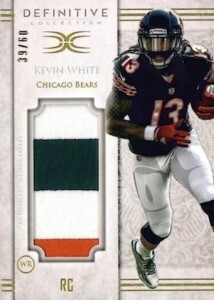 This is Topps’ swan song before they lose NFL licensing. Enjoy it while it lasts. A decent try but not worth $750++ per box especially given the number of redemptions. I pulled two out of my box which seems to be the norm based on numerous online breaks I have seen. At the end of the day no super premium product should have this number of redemptions IMHO unless they are for veteran superstars/ HOF players. Looking forward to NT release in hopes of a better value for money premium product. Yes, there are some sweet hits in this, but my biggest peeve is every year the cost sky rockets, while the # of cards, and the # of quality hits are in a down spiral. If they wanna jack up their prices, amp up the good hits. By the way SS, one day when you grow up and have leave the basement of your mom’s house, you’ll see what it means to have responsibilities, and you can’t pay a house payment for 8 cards. God i wish Panini would go out of business. I wouldn’t even care about the 49 auto redemptions they still owe me going back to 2011. Seen and heard too many breaks having like 3-5 if not more Jesse James in a case. Too many dupes for some teams. Just not a good coalition in most cases I have seen. I’ve bought 3 boxes and got some great cards, but the resell is garbage. A 1\1 NFL Rookie on-card auto should sell great, even Melvin Gordon. 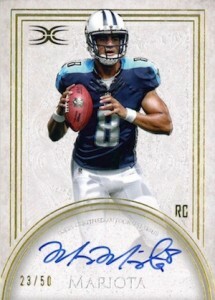 I’ve pulled a Marcus Mariota RC in every box #/10 with jumbo patch, #/30 gold framed and #/50 no patch…flooding the market with the best rookies devalues the product yet the sealed boxes go up in price? Overall, I got my money’s worth, but if from the reviews I’m seeing I don’t know how many times I’ll push my luck. Beautiful cards, I am a fan ! I love the designs but there are too many redemptions in this product. Hey Topps, it’s been 7+ months since the release. You think you can get around to filling the redemptions that you flooded this set with? I bought boxes that were half redemptions. Half. For 700$, and they haven’t been filled, and I’m petrified of requesting a substitute and ending up with a Clive Walford auto in place of the Marcus Allen, or some other crap card for the 1/1’s I’m waiting for. Panini and Topps are selling a product and basically saying “Yeah, we’ll get it to you later,” and meanwhile, a guy like Karlos Williams is out of football, and the value of that card plummets. Is there any other industry that gets away with selling something, but actually not giving it the customer, and providing no explanation or information as to when they will send it? It’s not like these guys aren’t signing autographs. There have been dozens of other products released that they have autographs in, so why not have them sign these cards?